If birth rate is greater than death rate the population will increase. If the death rate is greater than birth rate the population will naturally decrease. The greater the difference the greater the rate of Natural Increase. 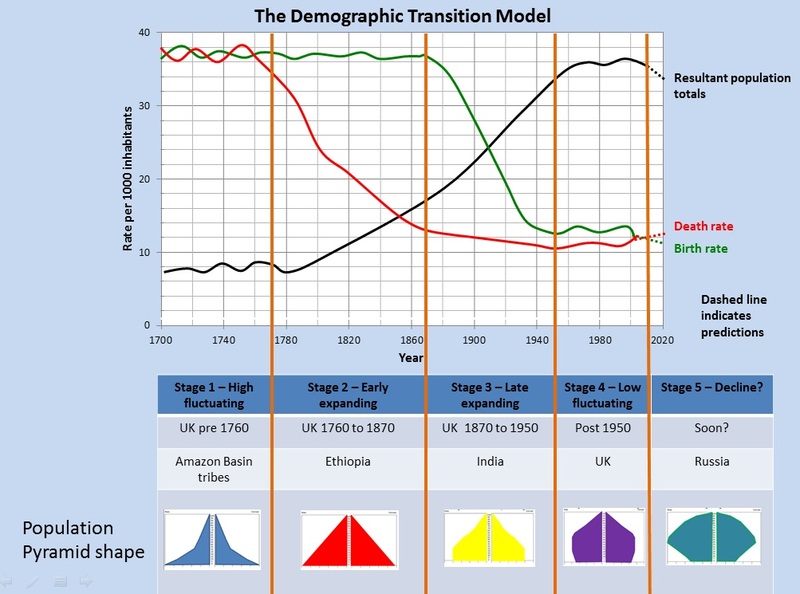 The rate of Natural Increase is much higher in developing countries of the world and many countries in MEDCs are actually experiencing population decline. 4) Could there be a stage 5? What could happen in stage 5? What consequences would that have for governments? Major patterns and reasons for those patterns are summarised in the table below. c) Industrialisation and mechanisation means less workers are required. d) Wealth increase and people are more materialistic, so want less children. Stay low because of reasons in stage 3. High due to disease, Famine, poor diet and hygiene, little medical science. Start to decrease due to improvements in medical care, sanitation and water supply, supply and cleanliness of food. Continue to fall. developments such as underground sewers, medical developments such as penicillin, surgery such as heart bypasses and inoculations help.